Cook Political Report’s Jennifer Duffy had an interesting survey of the 2016 Senate election landscape, linking the unpredictability of the primary process with forecasting the fall’s Senate elections. Even if—as now seems likely—Hillary Clinton comfortably wins, Duffy noted examples of the losing party doing OK in Senate elections, pointing to 1964, 1972, 1984, 1996, and 2000. (The 1996 races deserve more attention from both political analysts and historians, since the GOP’s key victories came, counterintuitively, in moderate states—Oregon, New Hampshire, Maine—or in Clinton’s Arkansas.) The first three years Duffy deemed “lonely landslides,” with LBJ, Nixon, and Reagan winning overwhelming victories but their parties having middling (or worse) performances in the year’s Senate races. These three “lonely landslides” seem to me quite different. 1972 definitely was such a phenomenon—liberal Democrats captured GOP seats in South Dakota, Maine, Colorado, Iowa, and Delaware. 1984 was murkier—Democrats gained seats, but there were relatively few Republican pickup chances after a good year for the GOP in 1978. And Reagan’s margin certainly carried Mitch McConnell to victory in Kentucky, probably accounted for Jesse Helms’ win in North Carolina, and ensured that seats of some GOP freshmen (New Hampshire, Maine, Colorado) never became competitive. Finally, in the Exon-Hoch contest in Nebraska, it produced the 1980s equivalent of the 2014 Warner-Gillespie race in Virginia—a near-upset of enormous proportions in a race that had attracted scant attention before Election Day. In short, unlike Nixon in 1972, Reagan’s coattails affected the Senate elections. 1964, on the other hand, shouldn’t be considered a “lonely landslide” at all. Democrats netted two seats, defeating Republican incumbents in New York, Maryland, and New Mexico, while appointed senator Pierre Salinger lost in California. But this outcome came after the election cycle of 1958—the best performance for either party in any Senate cycle in the postwar era. Including the subsequent results from the new seats from Alaska and Hawai’i, a 49-47 Senate was transformed into a 65-35 one. As always occurs with wave elections, fairly weak incumbents won in tough states (Indiana, Wyoming) or as a result of flukes (Utah, when a conservative independent siphoned votes away from incumbent Arthur Watkins; California, after the GOP senator and governor disastrously tried to switch jobs; and Ohio, where Stephen Young’s upset win was almost entirely attributable to unions turning out voters to block a right-to-work referendum). In a neutral environment, it seemed unlikely that most of these seats would be held. Democrats had additional vulnerabilities in 1964. In North Dakota in 1960, Quentin Burdick had won a special election by campaigning against Dwight Eisenhower’s farm policies (“Beat [Ezra Taft] Benson with Burdick”); he would first stand for a full term in the heavily Republican state in 1964 having to defend the policies of a Democratic agriculture secretary. Deaths of Democratic senators in Oklahoma and Tennessee produced internal party tensions; in both cases, a contested primary led to the ouster of the appointed senator and his replacement by a weaker, more liberal nominee. Republicans, on the other hand, had only nine seats to defend. In every state but Arizona, where Barry Goldwater vacated his seat to run for President, they had an incumbent who had survived the disastrous environment of 1958. Class of 1958 Democrats recognized their vulnerability, and their need to stay on LBJ’s good side. One of my favorite LBJ calls came with Indiana Democrat Vance Hartke, after the near-collapse of the tax bill in the Senate Finance Committee, as logrolling amendments by committee members exploded the cost of the bill. Getting the bill passed—and the political benefits it would produced—required some blunt lobbying of Hartke, who wanted a tax break for a musical instruments plant in Elkhart, Indiana. Johnson maintained the interest in helping the weak Democratic incumbents throughout the fall—he did a late campaign swing through Nevada and Wyoming not because of the importance of the states’ electoral votes, but to boost the efforts of beleaguered incumbents Howard Cannon and Gale McGee. “I’ll come on out there and campaign either for you or against you. Whichever you think will do the most good,” he told Cannon before visiting the state. In the map below, the Democratic candidate won in blue states, the Republican in red, with the darker the state, the heavier the margin. The purple states are Democratic Class of 1958 seats—every Class of 1958 incumbent won, though Howard Cannon (Nevada) and Stephen Young (Ohio) survived by less than 1 percent. Finally, in two of the Democratic pickups, Johnson’s state margin far exceeded that of the Democratic Senate nominee. LBJ carried New Mexico by 19 points; Joseph Montoya won it by 9. The President’s margin in New York was 37 points; Robert Kennedy’s was 10. Would either Kennedy or Montoya have won without a Johnson landslide? The third pickup was Maryland, a landslide for both LBJ and Senate candidate Joseph Tydings. If the 1964 presidential race had been 51-48 rather than 61-38, Democrats easily could have lost seven or eight seats. Johnson’s Senate “landslide” came in preserving the 1958 gains, and preventing a Democratic collapse in the four contested Senate races in the South. Johnson’s coattails had one other, less visible effect; they nearly carried to victory exceedingly weak Senate candidates in Arizona, Pennsylvania, and Delaware. In Pennsylvania, a bitter Democratic primary (followed by a lengthy legal challenge to her victory which left the party without a nominee for weeks) robbed Genevieve Blatt of institutional support against Senator Hugh Scott. Johnson didn’t have much interest in her campaign, either. But since he won the state by more than 30 points, Blatt almost pulled through anyway; her attempt to become the first female senator who hadn’t been preceded in Congress by a spouse fell short by 1.5 percent. Johnson was more involved in the battle for Goldwater’s Arizona seat, which matched the state’s three-term governor, Paul Fannin, against Carl Hayden’s administrative assistant, Roy Elson. In October, Johnson suddenly decided to make a brief “nonpolitical” appearance in the state, with the intent of bolstering Elson’s longshot effort. Roy Elson: It [the Senate race] is a horse race, and with your appearance, I think it will be the thing that will swing it, and I can win. President Johnson: How far is your airport from town? President Johnson: Now, how would a church thing—would we just drive downtown and go to church, and go back? Elson: That would be—yes, what I would suggest. President Johnson: You have a good Christian church there? President Johnson: A sizable congregation? President Johnson: You know anything about the preacher? President Johnson: You check that in the morning, and we’ll talk to you. President Johnson: Let’s be sure that he’s an able fella, that he’s not going to make some segregation speeches. Elson: I would check that right away. President Johnson: And . . .
President Johnson: I would think, offhand, that we’d be in there about 9.30, 9.45, and have about 30 minutes at the airport. At which time I would say that Carl Hayden wanted me to stop off in Arizona. So I’m going to replenish their treasuries by buying some jet fuel from ‘em. [Elson chuckles.] And I want to see my old friend Roy Elson, that I’d worked with many years in Washington. And I wanted to tell Arizona how much they meant to me, and although . . .
We have two great parties in this country. An Arizona man is leading one of ‘em, and a Texas man is the other. And it looks like the Southwest is doing pretty good. President Johnson: That was what I had in mind, and that’s what I offered. Now, I thought it might gin Gene [Pulliam] up a little, too. He thinks we’re going to carry Arizona. Elson: I think you are, too, Mr. President. In the end, the campaign swing wasn’t quite enough—Elson lost by 2.8 percent. In Delaware, LBJ’s involvement was much more direct. The seat was held by John Williams, the lead Senate critic of Johnson’s ethics and a man the President very much wanted to defeat. Unfortunately for the President, Williams’ 1964 opponent was Governor Elbert Carvel—who Williams had beaten in 1958 by 6.6 percent. This clip, between the two of them in October 1964, gives a sense of Carvel’s meager political skill—LBJ sounds like the Senate candidate desperate for presidential assistance, Carvel the President coasting to a safe victory. With Carvel clearly unwilling to do enough to help himself (how many trailing Senate candidates would turn down an additional presidential visit? 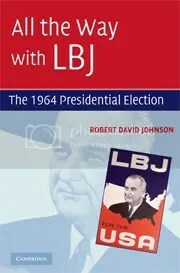 ), LBJ functioned as a de facto strategist, even reaching out to Robert Kennedy for assistance in the anti-Williams effort. Even Johnson, who won Delaware by 22 points, wasn’t enough to deliver for a candidate as flawed as Carvel, who improved on his 1958 performance against Williams but still lost by three points. Two states did provide some evidence for the “lonely landslide” thesis, although each result was explicable not by a national trend but by internal state matters. In Hawai’i, Hiram Fong survived a challenge from a strong opponent, Congressman Thomas Gill, even as Johnson carried the state by 57(!) points. But ethnic politics worked to Fong’s advantage (Gill was white), as did support from key labor unions in the state. In California, Johnson’s 18-point margin couldn’t save Pierre Salinger, who was undone by divisions within the state’s Democratic Party and a backlash to a fair housing law that voters repealed (by a margin larger than that of LBJ in the state) in a 1964 referendum. There are, of course, other reasons to suspect 2016 might not produce a Democratic Senate landslide. The availability of tens of millions in outside spending provides vulnerable Republicans an advantage that 1960s Senate candidates would not have possessed. And beyond Wisconsin, Illinois, and New Hampshire, Democrats in 2016 seem to have something of a mismatch problem—their weak bench, a result of the 2010 and 2014 defeats, has resulted in their most attractive candidates appearing in very tough states (Missouri and Arizona), with less-than-ideal candidates running in better states for the party (Florida, North Carolina, Pennsylvania, Ohio). But Republicans shouldn’t look to 1964 as a historical lesson suggesting their Senate candidates could survive a major Trump defeat. The year wasn’t a “lonely landslide”; Johnson’s victory had a significant impact in virtually every competitive Senate election.